A reference to that which is situated in front of something, but at a lower level or below it. 1. Someone who, or something, that is lower in value or quality: "Dina bought some inferior pearls at the garage sale." 2. A reference to someone who is lower in rank, position, or status; being subordinate. 3. Descriptive of something that is not of the best quality; mediocre; commonplace. 4. In anatomy, lower in position; situated beneath another part. 5. Referring to a a plant ovary which is enclosed by and fused with the receptacle so that it is situated below the other floral parts. 6. Astronomically, orbiting or occurring between the sun and the earth: "There are inferior planets or certain astronomical elements which are lying below the horizon." A quality that is worse than other people or things. 1. A reference to being lower in station, rank, degree, or grade. 2. Lower in place or position; closer to the bottom or base: "The explorers were descending into the inferiorly deep regions of the earth." 3. Being of a comparatively low grade; poor in quality; substandard. 1. Relating to hell, or the world of the dead; hellish: Irene had the most infernal experience when she was bicycling in the very hot desert. 2. Diabolical or fiendish: There are too many infernal instruments used in wars. 3. Awful and abominable: The people on the street were greatly disturbed by the most infernal racket of the jackhammers being used by the construction workers. © ALL rights are reserved. 1. In a manner that is very irritating. 2. In what seems to be hellish and terrible. 1. A very intense and uncontrolled fire in a building or some other place. 2. 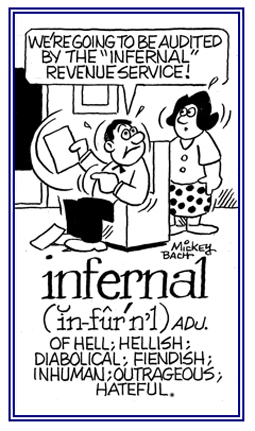 A situation of pain and turmoil caused by fiery heat or destruction. 3. A place where the wicked are thought to be punished after death. Having the gills on the sides of the body, under the margin (space between one edge or line and another one) of the mantle (fold or pair of folds of the body wall that lines the shell of mollusks and brachiopods (marine animals with bivalve shells). Pertaining to a location that is situated below and to one side or the other side. Part of a modern combining form of Latin inferus "low" (as in inferior), used in scientific terms (primarily in Zoology) to designate parts situated low down or on the under side: "The infero-anterior is situated below and in front; infero-frontal, in the lower part of the forehead; infero-lateral, below and on one side; infero-median, in the middle of the under side; infero-posterior, below and behind." Referring to that which is situated below and behind something. A defender, supporter, or champion of the underdog: "An underdog is a person or a group that is in a competition and it is frequently related to someone in electoral politics, sports and creative works, and who is usually expected to lose." Situated below or under the collar-bone.